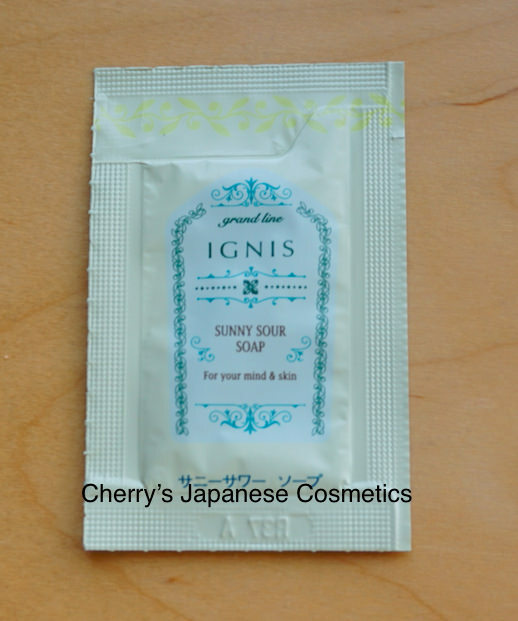 I (Cherry) got a sample of Ignis Sunny Sour Soap, a new face wash.
Let me share with you my review. When I open a package, I found how fresh scent of Lemmon, they are using Lemmon cropped in my area 🙂 My area is famous as citrous. I added few drops of water to whip. It was really easy to make rich bubble. My skin is sensitive, and dry-combination. In summer, I am tending more oilier. I like feeling “refreshed”. But I do not want face washes to make my face drier afterward. As my preference, sadly it is a little bit “stronger”, maybe I may still be drier. If you have oily skin, you may like this. But the scent of Lemmon is stronger, if you dislike citrus smell, this is not for you. Please check the latest price, and order from here:Ignis Sunny Sour Soap, or in JPY Branch!